Drag racing lost another longtime friend when pioneer C.J. 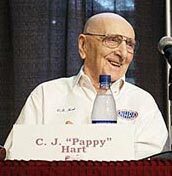 "Pappy" Hart passed away June 26, 2004 at age 93. 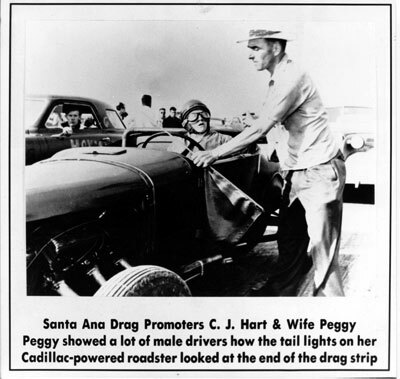 In 1950, he and his late wife and partner, Peggy were the founders of the Santa Ana Drags (1950 to 1959) on an unused runway at the Orange County Airport (where John Wayne Airport is now located), in Orange County, California. 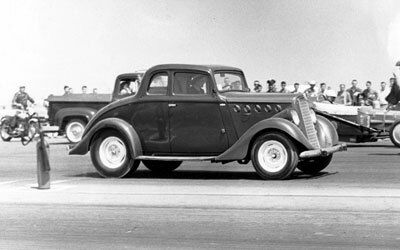 Although Goleta was the first dragstrip of record, it was C.J. 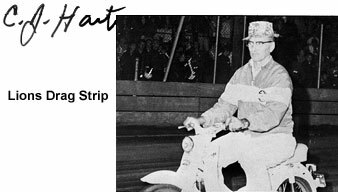 Hart who created the very first professional dragstrip that charged admission. 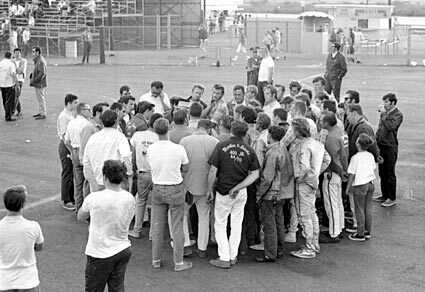 Young people from all over the country heard about this unique form of racing and came out to California to watch how the races were organized. 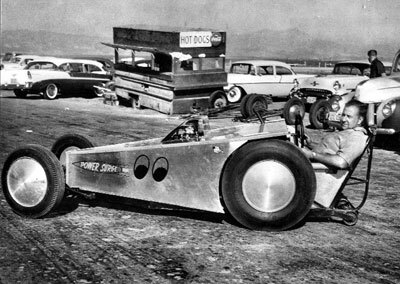 Within months of the first dragraces at the old airbase, timing associations had sprung up all over the nation, and organized drag racing on safe and sanctioned dragstrips was born. 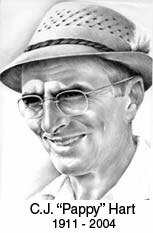 His legend and indelible imprint on our sport grew from there including overseeing and constantly improving the most famous drag strip of all time - Lions in Long Beach, CA. 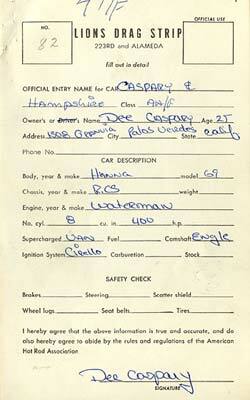 "Pappy" was known to legions of drag racing fans as the one of the grand old men of the sport. 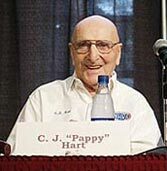 In his later years, Hart was a member of the NHRA Safety Safari, traveling the country and greeting well wishers at every stop. 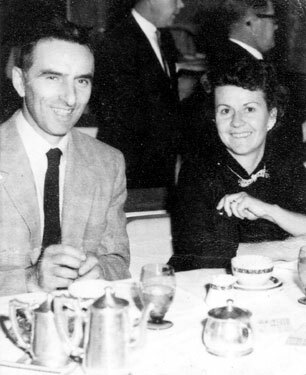 This is the earliest known shot of CJ and Peggy Hart circa 1950. Married in 1934, the two were virtual inseparable until Peggy's death in 1980. Had it not been for drag racing in general and close friends at NHRA (i.e. Steve Gibbs) in particular, self admittedly Pappy would not have been far behind her. 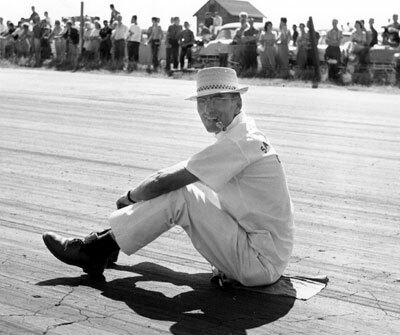 Pappy taking 5 in the middle of the track at Santa Ana. A rare shot of Pappy without a hat. This was at Santa Ana when CJ and Peggy were everything from ticket takers to the flag starters. When it came to actually racing, that was all Peggy. When asked, CJ would tell you that she could drive anything ... and damn good. 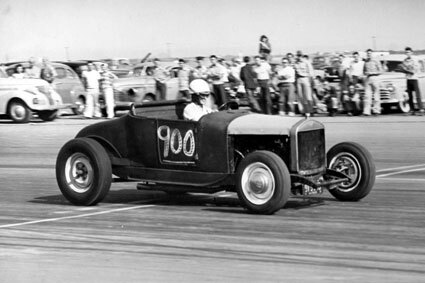 Peggy Hart in 1951 wheeling Pappy's 29-T at Santa Ana. 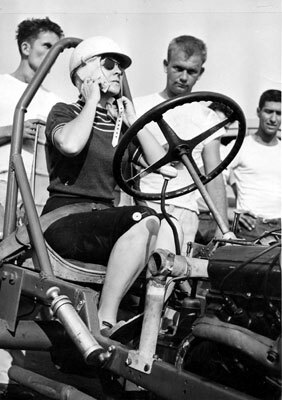 Peggy in her Cadillac powered dragster circa 1953. Check out the radiator set up - so she could drive the car home. If you ever knew her, nothing she did would surprise you. When they ran Lions it was common knowledge that CJ would often let you slide when you screwed up but you didn't cross Peggy! Like we said, Peggy could drive anything. Hemi power at Santa Ana. 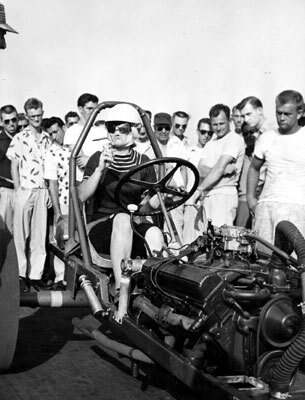 One can only imagine what all these guys were thinking when a woman had one of the fastest cars around. 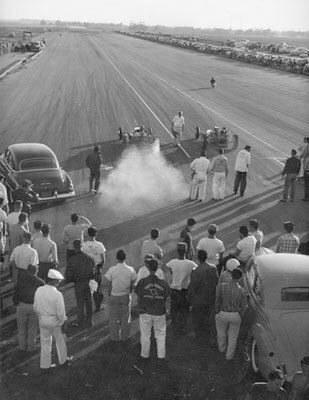 Keep in mind this was the early 50's and drag racing was not only a baby but it was a man's baby. Peggy sporting her straw hat crash helmet. Santa Ana flag start circa 1952. No idea why they are so close together or how the starter avoided being hit! Being basically an airport, Santa Ana didn't have permanent facilities like a timing tower so everything was done from a car. 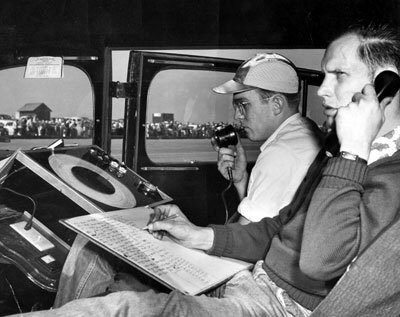 Here is the announcer and time keeper at work. Nice overhead shot of Santa Ana circa 1955. 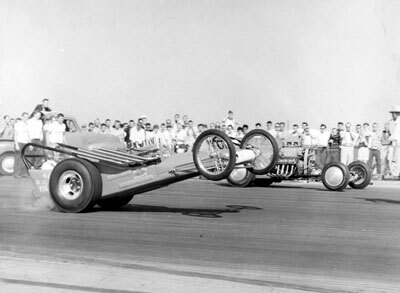 Pappy flag starts a pair of stocker in 1959. 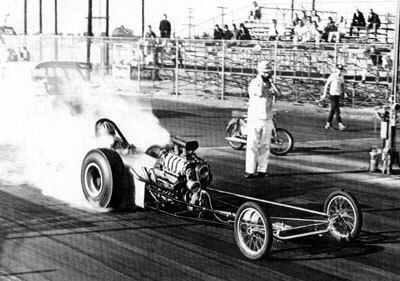 Santa Ana, 1959 TV Tommy Ivo in his first dragster - Pappy on the right with his patented straw hat. Creighton Hunter (Pappy's partner) at Santa Ana. 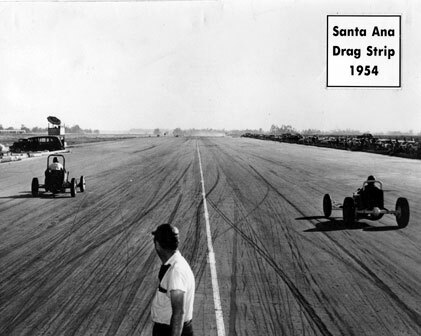 When Santa Ana closed in 1959, Hart helped stage races at a Taft airport facility and later at Riverside Raceway. 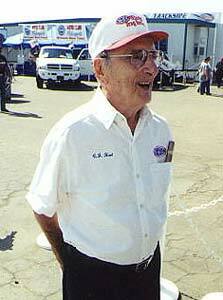 In 1963, the Lions Club Board of Directors hired Hart to succeed Mickey Thompson as manager of fabled Lions Dragstrip. 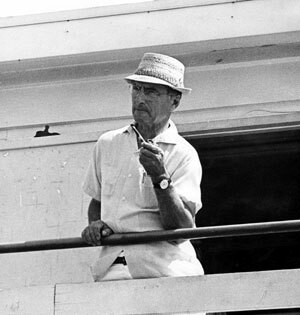 Hart later served as a consultant to many tracks, offering advice on everything from racing surfaces to pit areas. 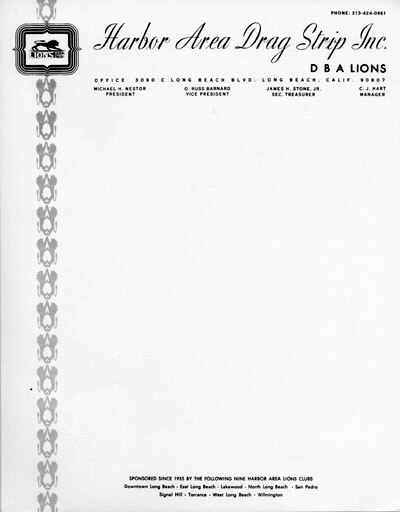 A very rare virgin sheet of Lions letterhead paper. 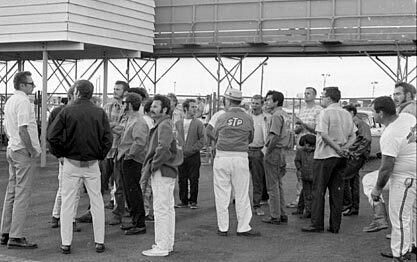 CJ and Peggy took over the management of LADS in 1963 and stayed right up to the Last Drag Race in 1972. Classic Pappy overseeing the pits out the back door of Lions crossover bridge tower. A typical Pappy story was this incident in 1965 with Sneaky Pete's "Tinker Toy" A/D. That's Pete in the red shirt. Check out the chute. 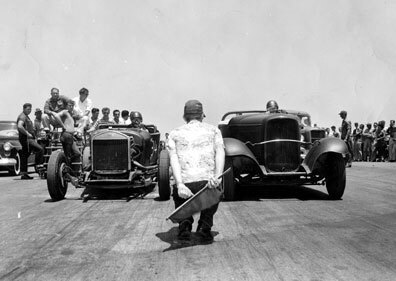 At the time Pete didn't believe in using a chute - extra weight and claimed his car stopped fine without one. But Pappy told Pete he would either put a cute on his car or put it in the box and go back to Georgia. Pete went and got the smallest lightest chute Simpson could make. Needless to say, CJ wasn't completely satisfied but Pete had done what he told him to do. CJ starts George Bolthoff in Billy Martin's '400 Jr.'. Over the years Pappy had some of the best starters in the business, most notably Larry Sutton. 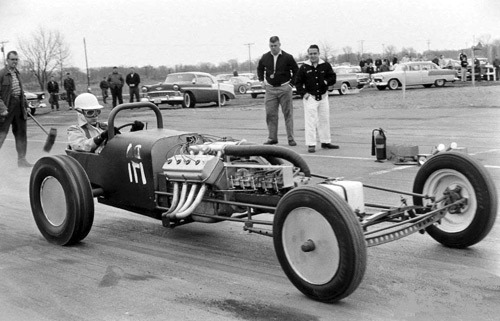 There were several others including Bill Keys, Tim "Weed" Kraushaar, "Big John" and even a kid named Don Ewald. CJ (STP jacket) was big on "Drivers Meetings". Here's a typical one on any given Saturday. In the middle is Ronnie Hampshire, Dave Condit (yawning) and Frank Pedregon. 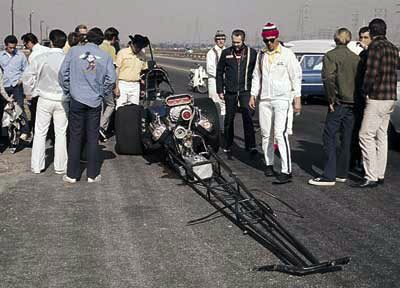 Like any drag strip, Lions had its share of accidents. However, the Harts made sure they had the best safety crew and equipment available at the time. 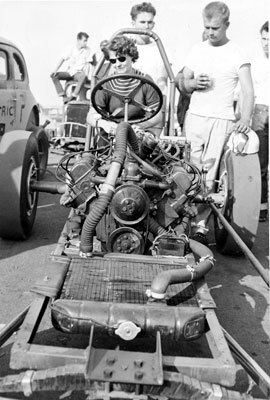 Case in point was this Saturday night incident involving Larry Dixon Sr. and his crankshaft which exited the engine in the lights. The resulting crash was one of the worst I ever saw - really thought LD was a goner. 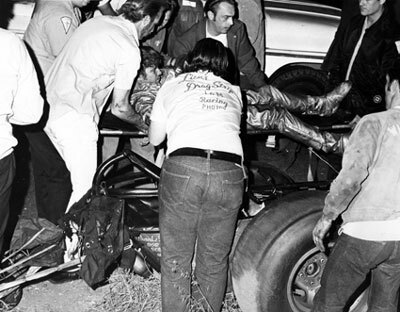 But here he is being lifted onto a stretcher by Bill Keys and John Ewald. Virtually no injuries and he had a new car on the track three weeks later. Nobody can remember whose car this was or what happened. Not a good sign since I'm in the picture (Mickey Mouse shirt) along with Larry Sutton (cowboy hat), Bill Keys (asst. starter) and of course, C.J. Hart backed by his ever present Honda scooter. 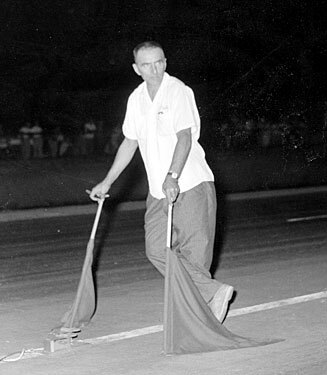 Pappy cared deeply about "his racers" and would take any accident lightly. Brother John had literally thousands of these Lions Tech Card in his hands over the years. Pappy would give them to him at the end on the night so he had the information on his photos. Well, all but about 75 found their way to a trash can. Here's one that was saved. All ya gotta do is read it. 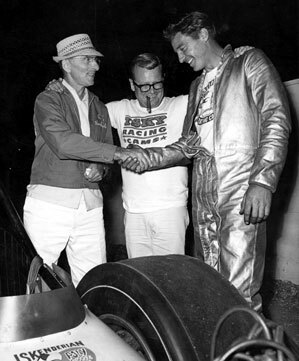 Pappy congratulates James Warren after one of his many AA/FD wins at Lions. This looks to be 1966 or so and that would be the personable Bernie Mather (who was probably announcing the event) between them. 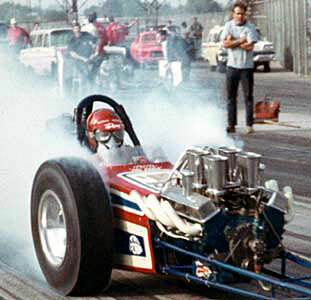 Just one of Pappy's legacies was the very popular Jr. Fuel dragster class that he set up in 1966. These light weight 301" Chevy's on 98% were a staple at "The Beach". It was a really fun class that let many get their start in fuel racing. Another first attributed to Hart was the roller starters. Later most all the other tracks used roller starters but they were powered by auto engines, the Lions version (which was the very first) was electric. Needless to say, the huge load on the motor often resulted in a power outage or at the very least a dead roller. This was very cool because then we got to go back to push starts! 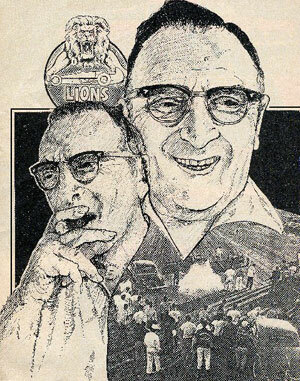 During Pappy's reign at "The Beach", Lions consistently featured the best shows in the country. The pits were very large which afforded room for hundreds of cars. This if from 1967. In 1972 Pappy and Peggy hung it up when the city of Long Beach forced the closure of Lions Drag Strip. 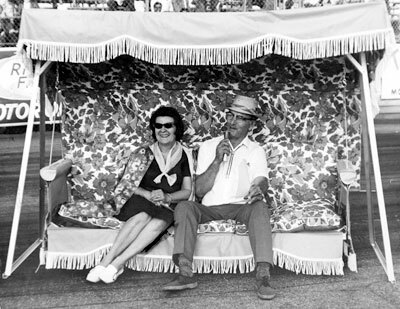 As a "retirement" present all the employees at the track pitched in and bought the couple this lounge that was presented right on the track. Something tells me it never got a lot of use as the Hart's were not ones to stay inactive. I believe this is one of the last public photos of Peggy. 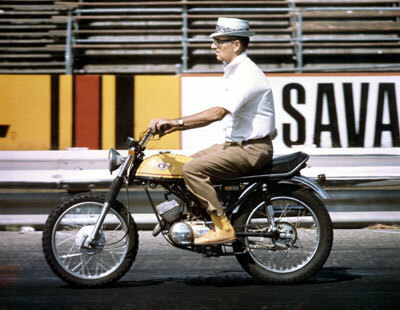 Not sure of the time frame on this shot but the image is familiar... Pappy on a scooter. 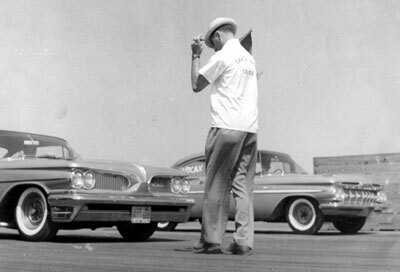 After Peggy's death, Pappy missed the sport and was convinced by then NHRA Competition Director Steve Gibbs to join the Safety Safari. For many years he hauled the jet track dryer from stop to stop and help keep his fellow Safari workers refreshed by bringing them beverages and ice. 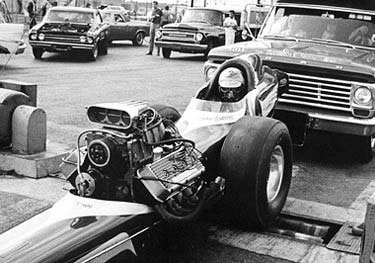 By all accounts his participation with NHRA added many years to his life. 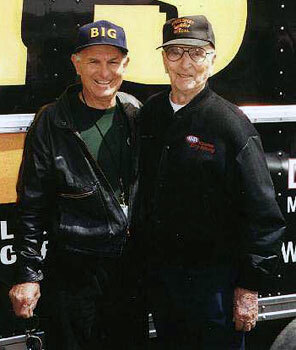 Garlits & Pappy in 2001. 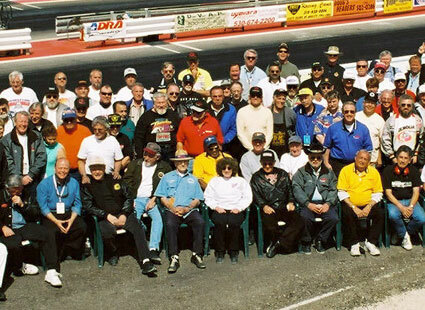 In 2001 at Fallon's Top Gun Dragway these historic photos were taken with CJ Hart front row center. The prerequisite for being in the shot was 20+ years of drag racing involvement. The names are too numerous to list (or even remember). 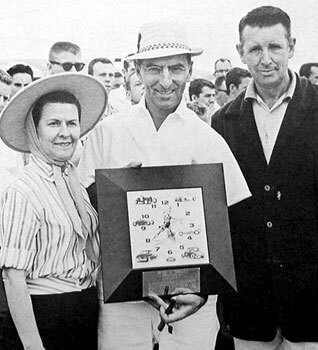 But that's Shirley next to Pappy - Garlits next to her. Steve Gibbs is on CJ right. "Diamond Jim" Annin and Pappy share some time together at the NHRA Wally Parks Motorsports Museum... could have been Steve Gibbs retirement party. 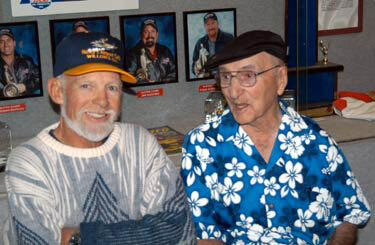 Steve Wallace (who worked for Lions in the mid 60's), Pappy and Jack Williams. Pappy wasn't a religious man, but life was never the same for him after Peggy died in 1980. Shortly before he died, he told a friend, "I've waited 24 years. I'm going to see Peggy." Pappy's last public appearance was a fun one. 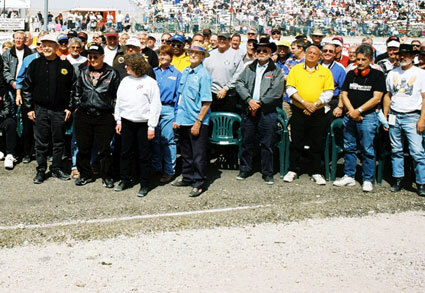 On Saturday, April 17, 2004, the staff of the Wally Parks Motorsports Museum put together one of the most interesting and historical group of men ever. The operators of the major So. 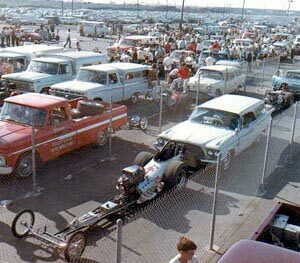 Cal drag strips. 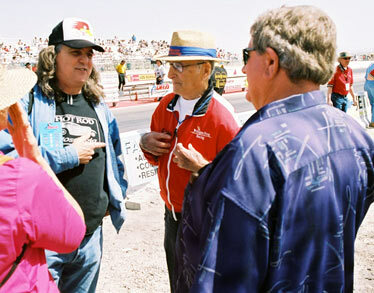 This panel consisted of Blackie Gejeian, Fresno: Steve Gibbs, Irwindale; Chuck Griffith, Pomona; C.J. "Pappy" Hart, Santa Ana and Lions; Harry Hibler, San Fernando; Mike Jones, OCIR; Don Rackemann, Saugus, Fontana & Riverside; and Louie Senter, Saugus. Moderator of the event was Dave "Big Mac" McCelland who also operated the Dallas Int'l Motor Speedway....yep, you get it...one of the most notorious group of characters ever assembled! Now there is one less "character" and God knows we will miss him dearly. 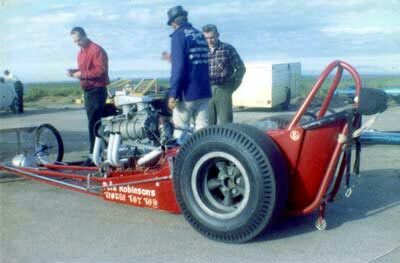 Lions Drag Strip - gone but like the Hart's, not forgotten.